At Shine Dental, we cater to the dental phobic and our staff is very sensitive to the needs of those with dental anxiety. We strive to offer the most comfortable and enjoyable experience possible, and we emphasize patient education and finding solutions that limit problems later down the road. Our vision is to inspire and invigorate every guest through incredible care. If you're missing a tooth, dental implants may be beneficial to restoring your smile and confidence. Is cosmetic dentistry right for you? Come in for a complimentary consultation, a $125 value! You can have straighter teeth without the need for metal braces and receive treatment discreetly. With our two convenient locations in Winnipeg, Manitoba, we care for patients from Downtown Winnipeg, St. Boniface, and the surrounding areas. 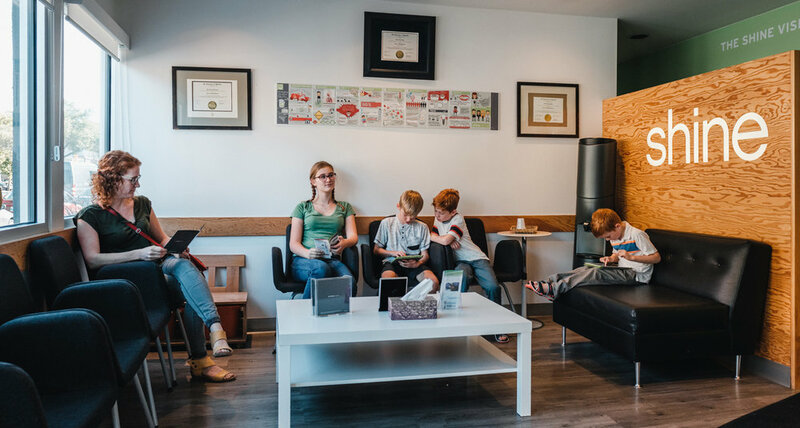 We are your local, family-friendly dental office, and we handle everything including your family’s routine hygiene visits, dental implants, orthodontics, cosmetic dentistry and more! All treatments are performed by our team of gentle and compassionate dentists, Dr. Brent Wong, Dr. Saniya Riyaz, Dr. Karen Rosolowski, and Dr. Brian Ho. Your comfort is important to us, and we offer many of the modern amenities you’ve come to expect in a dental office. We believe that whatever your dental needs may be, you will be treated with the highest quality dentistry available and with the most compassionate, respectful care you deserve. We look forward to meeting you at your appointment! Dr. Brent opened Shine in 2004 and he works at the 360 location focusing his steady hands and years of experience on his passion - dental implants! Dr. Saniya has been providing thorough and efficient quality care at Shine since 2009 and works out of the Provencher location. Dr. Karen began as a hygienist, became a dentist & rejoined us in 2013. Patients at our Provencher office enjoy her professional & caring attitude. Dr. Brian met Dr. Brent at a Shine The Light trip and joined the Shine team in 2016! He brings his skill and positive energy to the 360 location.